We ask the questions here Comrade. Family, Factory, and…Rock and Roll? francisco de assis oliveira on На Дача! Waging a modern war requires many things, weapons, ammunition, vehicles, uniforms, supplies, and most of all, soldiers to fight. However, raising a standing military is expensive, and it takes away from the workforce that pays for all of the things needed for war. When the Soviet Union was on the march towards the Second World War in the 1930s, Josef Stalin, the leader of the USSR had the challenge of creating a military that could stand up to Germany and Japan, Russia’s largest rivals. However, Stalin had a few problems that his peers in other nations did not. First, he planned on keeping a tight control over all Soviet military forces. Military leaders are the biggest threats to dictators, as a popular officer with troops behind him can easily topple a hated tyrant. To prevent a coup, Stalin began systematic purges of his Officer Corps, killing off the majority of military leadership. This in turn complicates Stalin’s second major problem in forming a military in the USSR: the relative inexperience of recruits and the existing military forces. Tsarist Russia’s military had been killed or fled after the revolution, and with he remaining officers mostly put to death in the purges, there was a shortage of experience, and no one to train new talent. To combat this, Stalin implemented some policies that would increase general military readiness. In addition to creating propaganda films popularizing the military life, such as the film “Tractor Drivers,” released just before Germany and the USSR invaded Poland; Stalin set up programs to encourage fitness of the average citizen, training with weapons, and subtle familiarization with military equipment. Tractors being introduced to the collectivized farms shared controls and operation with tanks being quickly built in factories and prepared for war. If Stalin’s recruits from workers and the peasantry wouldn’t be well led, they would at least be well drilled. 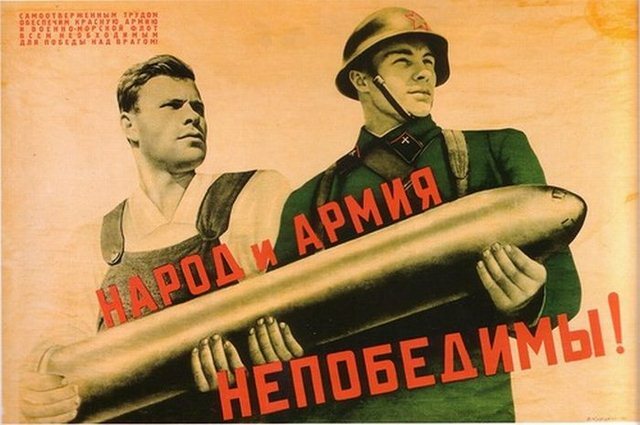 Propaganda ensured that Soviet citizens associated war and the military with patriotism. The aforementioned film, “Tractor Drivers” romanticized the military life, the ease of workers in battle, and espoused Soviet values by making the lead characters from across the Soviet Union. Great title for this post, and I like the way you provide a contextual lead-in to the Three Tractor Drivers. Why do you think the film was such a success? quick head’s up: looks like your post on Levitan might be picking up some spam. Make sure akismet is working and ask Anna or me if you need help keeping the enemies at bay. Your description of the Great Purges brings up an understated fact about the youth of Soviet Army leaders. The older generation was obviously fed up with the newest General Secretary’s actions, and they paid for it sometimes with their lives. Unfortunately, many of the people killed or exiled from the purges were innocent, and meant no harm to anybody but the true enemies. Stalin’s military goals were quite severe, and would have required more intellectual effort than power shifts at the top. This is a great topic, as I’ve never personally heard much about the Soviet military and its capabilities. It doesn’t surprise me that Stalin implemented propaganda techniques in order to paint a positive, “romanticized” version of his ideal army. Great analysis of the purges. I think its very interesting how Stalin’s actions affected the overall competency of the Soviet Military during WWII. Previous Previous post: Cinema, the new Vodka, the new Church. Next Next post: The three amigos.